As promised (a few days late, but hey...) today's review is Cover Girl's newest foundation Natureluxe Liquid Silk. When I first saw the commercial for this I was intrigued by the fact that they claimed to have "removed a harsh synthetic and added a touch of cucumber." 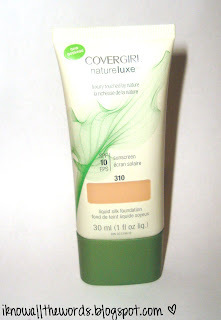 I am a former user of Cover Girl foundation -way back to elementary school- and I remember that terrible scent it had. I picked up a bottle of Cover Girl's Clean foundation and while the product is actually not bad, it has that same old CG scent that makes me want to *belch*. I am happy to say that this one does not have a terrible scent. I have the second lightest shade 310 Flax. 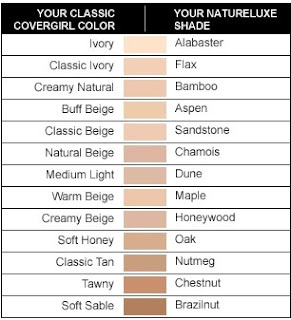 This line has odd names compared to what you usually see when foundation shopping, which I can't help but think will confuse the average person more so than be helpful. While I like that this is in a squeeze tube with a fine tip as opposed to the stupid bottles most drugstore foundations come in, I don't like that there is only a small viewing window. When I bought mine there was no tester for any shade and the display showed Flax as the lightest shade available. I really didn't want to have to make a return due to the wrong colour choice, so I ended up opening a tube in the store. I know that is a technical "no-no" but it worked out because I bought it. But, not everyone who opens one will buy it. I'm rambling... In short there should be a better way to see the colour of the product and some sort of safety seal on the tubes. "Foundation, with a hint of jojoba extract and cucumber water, gives a flawless, luxurious coverage with a barely there feel." -from tube. I have to start by saying that this foundation really is light. It feels like nothing on and application for me was as easy as applying a tinted moisturizer. The colour match is as perfect as I could ever want, and that in itself makes application that much easier. To apply this I have used a typical foundation brush, my hands and my new absolute fave a stippling brush. I don't think it really matters how you apply this, you probably won't run into any issues. I found the coverage to be a light/medium but I can be built a bit without getting gunky. I have had no issues with this "sticking" on my dry skin areas -dry skin gals know what I mean by that. 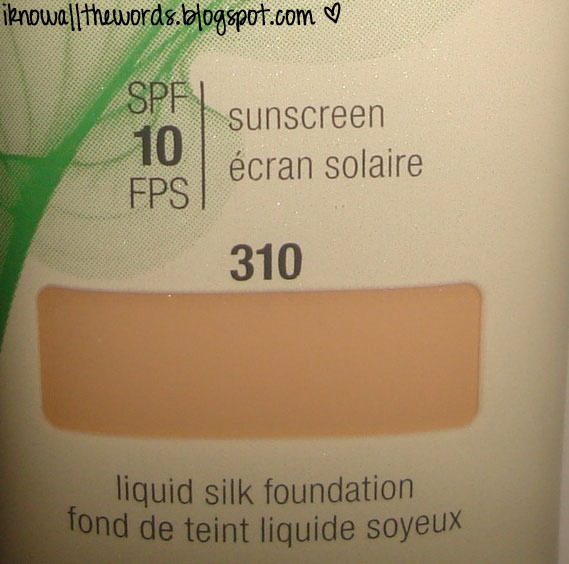 Although they don't use it as a selling point, this foundation is almost 100% transfer proof as well. It passes the Kleenx test for sure. Not sure what that is? To test the transferability of a foundation, gently rub it over dry foundation (that has not been set with powder.) This leaves only the slightest hint of colour. 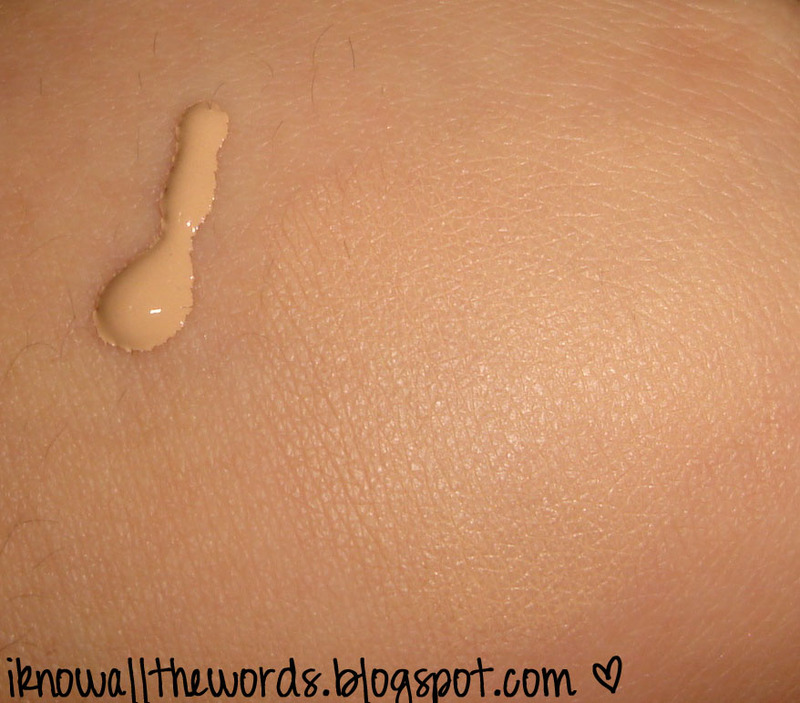 Overall I am really happy with this foundation. I do wish I hadn't bought where I did (at $17.99) because I am seeing it everywhere else for a fair bit cheaper, so shop around. If I had to grade it I would give it a solid B+. It looses a few marks for still having a slight scent (nothing offensive or lingering mind you) and for having no protection on the tube. wow that's expensive for a drugstore foundation I will say. Never been a fan of covergirl foundation, I heard the coverage on this is minimal. Glad you liked it though! I know, but for some reason I really wanted to try it. I should have waited it out a bit. not yet available here in our place, but it's expensive uh! that is pretty tempting to try. but so expensive for a drugstore brand!